Nutrition is one of the top priorities in pig farming and cost of feed accounts 60 to 80% of the total cost of production. Phosphorus (P) is the third most expensive nutrient in a pig diet, following energy and lysine. P availability is high in animal ingredients but it is remarkably low in plant ingredients as around 75% of the total P is bound to phytate. Phytate is an anionic compound having anti-nutritional effect on P availability to monogastric animals like pig. It also depress the activity of digestive enzymes, bind to dietary proteins and amino acids, and form calcium-phosphate-phytate complexes with carbohydrate. The enzyme phytase is chemically known as myo-inositol (1,2,3,4,5,6) hexakisphosphate phosphohydrolase and catalyze the sequential release of P from phytate and make it available to pig and other monogastric animals and reduce P pollution from animal waste like in intensive pig production. It is also increases availability of amino acids in feeds. 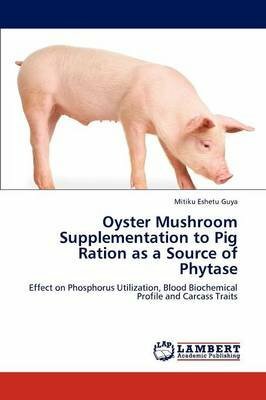 Oyster mushroom (Pleurotus species) has significant amount of phytase activity and in this study it was found that supplementation of oyster mushroom to pig ration had significantly improved P utilization.